The design target for lifetime is 1000 hours operation at maximum current. 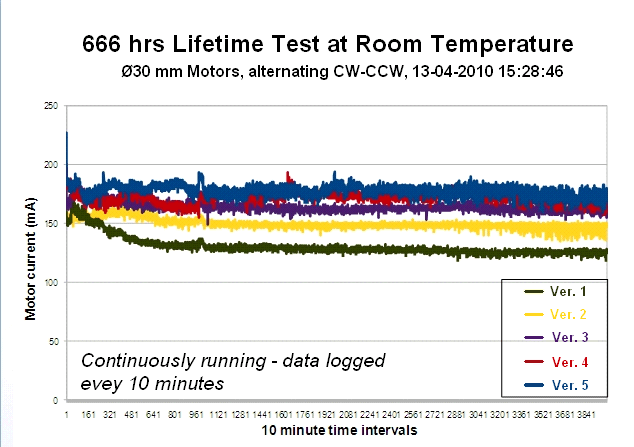 The graph below shows the results from a 666 hour lifetime experiment, based on a 30 mm diameter PCBMotor. 4 N, with a 4 mm axel screw centered in FR-4 without bearings. Each motor was driven by an evaluation kit controller with tracking of the resonance frequency. In the above experiment, one motor required some time to settle. Most importantly, however, was the lack of any wear-out at the end of the experiment. Disassembly of the motors afterwards showed some wear of the friction layer, but still a lot of margin. In most cases the customer application will require custom-designed rotor, bearing and spring constructions and it’s highly recommended to conduct lifetime experiments with the specific construction. Note: Self-heating (power dissipation) occurs due to continuous operation. To keep the motor’s temperature below 70 degree celcius, a 50% duty cycle is recommended, for example one minute on, one minute off. 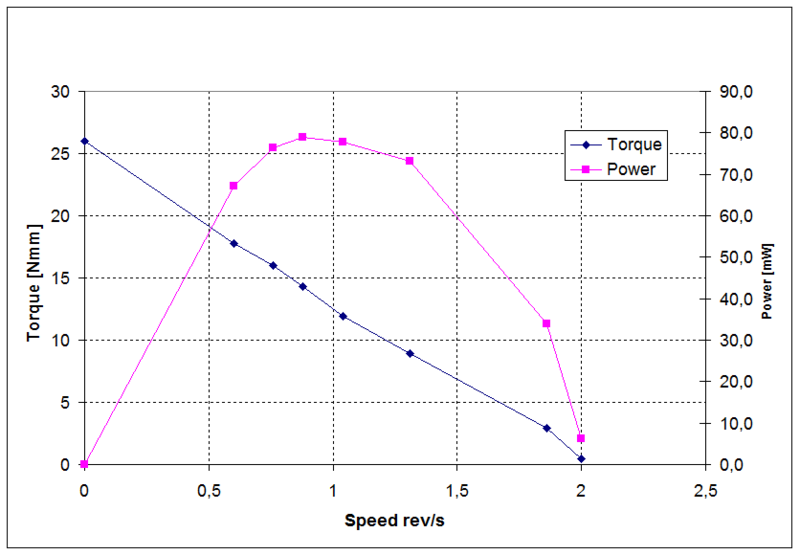 The graph below shows the motor performance and relationship between torque, speed and power (based on a 30 mm diameter on-board PCBMotor). Generally a higher pre-load of the rotors will result in lower speed but higher torque, so applications requiring speed rather than power, can benefit from a lower pre-load. The motor characteristics for a sample 30 mm stator is given below measured at 200 Vrms. 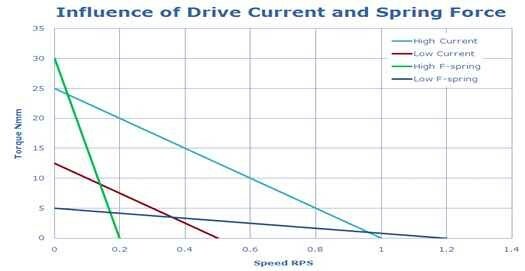 Notice the nearly linear Torque/Speed relation. 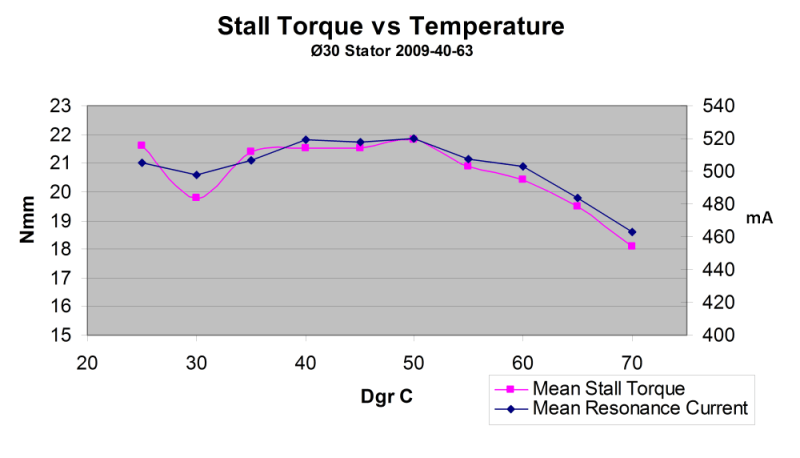 The graph below displays the motor’s performance under increasing temperatures. The measurement was made on a 30 mm diameter PCBMotor in a temperature controlled oven. Preliminary testing using multiple motors operating in an extended environment temperature range from -10 to 85 ̊C has been performed with promising results.